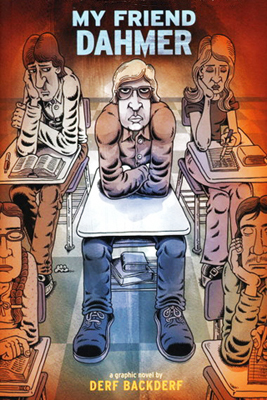 I confess that I borrowed Derf Backderf’s graphic novel, My Friend Dahmer, from the library for equal parts earnest interest in and morbid curiosity about the early life of Jeffrey Dahmer. For those who don’t know who Dahmer is, he was found guilty of incredibly heinous crimes and sentenced to prison, where he was later slain by a fellow inmate. I don’t really want to go into any more detail than that, simply because I’m willing to bet you already know more than enough about what he did. What you don’t know is why he did what he did. Neither do I, even after reading this novel. I suppose I didn’t really expect to find any concrete answers. I did expect a bit more insight than what Backderf provided. I think, though, for all his claims that he was doing this project out of a need to explore his past relationship with Dahmer and try to understand what happened that led Dahmer from who Backderf knew in high school to who he became, Backderf simply wasn’t up to the task of providing the “objective” look that he said he wanted to give readers. In fact, even though he claims at the beginning of the novel to want to give a more sympathetic look at the events of Dahmer’s youth that could have led him to commit such horrific acts, he then almost immediately calls Dahmer a monster undeserving of empathy. For a bit of backstory, “Derf” Backderf (his real name is John) was in the same high school class as Dahmer, ran in the same circle of maligned geeks, nerds, and social misfits—almost considered Dahmer a friend. Almost. Dahmer, however, was apparently too strange even for the strange kids. He wasn’t the most troubled of the lot, but he was too off-kilter for Backderf and his friends to consider truly part of their tribe. Makes you wonder what he was like, if even the outcasts sensed something “too twisted for color TV” dwelling within him. What Backderf provides in his graphic novel are some incredibly (and expectedly) troubling glimpses into moments and events that, piece by piece, began to form the image of the man this country would collectively deem a monster once his crimes came to light. As has always been the case, our journey backward is fraught with the agonizing Cassandra-like ability to foresee what was going to happen…and to be absolutely unable to do anything to change it. What’s even worse, though, is the fact that these things transpired in real time at one point, and still no one intervened. No one tried to find out why Dahmer behaved the way he did. No one tried to see if he needed help or simply needed someone to talk with about the things happening within his home life and within his head. Backderf several times in this novel castigates the school and how none of the adults in charge cared enough to intervene when it was often very obvious that something was wrong. Consequently, Backderf and his friends never really tried to intervene or inquire about Dahmer’s mental or emotional welfare either. They saw Dahmer as a freak, saw humor in his inappropriate behavior, his outbursts, his strangeness. They saw someone obviously lacking that filter that most people possess, that informs us of the difference between acceptable and not and regulates our behavior accordingly…someone they could goad into doing ridiculously inappropriate things in public…but they never really saw him as a friend. When he began to obviously slip further into strangeness and darkness, these “friends” ultimately turned and walked away. Again, hindsight is an awful feeling, and who we are in high school is controlled more by hormones and id-based sensibilities. Were they even that aware back then that the things Dahmer was doing then could ever lead him to what he later did? And even if they had intervened in some way, could they have done anything at all to change the outcome of this story? Still, I felt that Backderf never really made a case with his novel to support his assertion of friendship as he indicated in the novel’s title. If anything, I ended up feeling more like Backderf used his association with Dahmer as a means to capitalize from our collective curiosity about the darker depths of human behavior, without really having anything of merit to offer. Final Verdict: I found Backderf’s retelling of his time as Dahmer’s “friend” ultimately unsettling, unsatisfying, and exploitative. As long as people continue to simply dismiss and ignore those manifesting behavior of an unsettling nature, those people will continue to slip further away from sanity’s grip and into the realm of darkest possibility. As long as we continue to deem them monsters once they commit unthinkable acts, we will never find a way to cure them, help them, or at the very least, stop them. Backderf did nothing to change this attitude; instead he bolstered it. For these reasons, I won’t be adding this one to my collection.